This really is one of most popular Automatic Dosing Controllers. I think there are a number of factors that make this Chemical controller so popular. The first is the price, this unit has all the features you would expect of high quality dosing controller, but without the excessive price tag. The price point make The Compact the perfect choice for sites with a Swimming Pool and a Spa or a Holiday Park where dosing systems are required on a smaller budget. This Bayrol Automatic Dosing Chemical Controller offers superb stability. Which means the user will enjoy extended periods without having to recalibrate the probes. The benefit of this is twofold, the user has more time to take care of other tasks in the plant room but also it breeds confidence – that the displayed values for PH and Free Chlorine are correct! It sounds simple but not always’s what you get when you purchase an Automatic Dosing Controller. We wont name names but those in the industry know which controllers work and operate correctly with minimum fuss. We also know which units to avoid!! All dosing controllers for sale on this site have proven themselves in extensive field test by ourselves and our customers. We sell with confidence. Which means our customers can purchase with that same confidence. The Compact PM4 from Bayrol has a built in 5.7 inch touch screen display that offers a simple and logical menu system. The Recalibration process is also very intuitive. Because no dosing pumps are included you can connect which ever you choose to meet you budget and flow requirements. Another benefit of this Swimming Pool Dosing Controller is you have the ability to limit the functionality if you have inexperienced users. This helps prevent any problems associated with staff that like to change settings they don’t really understand! In the box is included everything you need to install the controller with the exception of the dosing pumps. Contact us in the office so we can talk you through everything you may require, such as saddle clamps to connect the removable injectors and foot valves, safety signage for your bunds or day tanks…etc etc. Bayrol is a German Manufacturer that enjoys an enviable reputaiton for quality and reliability. 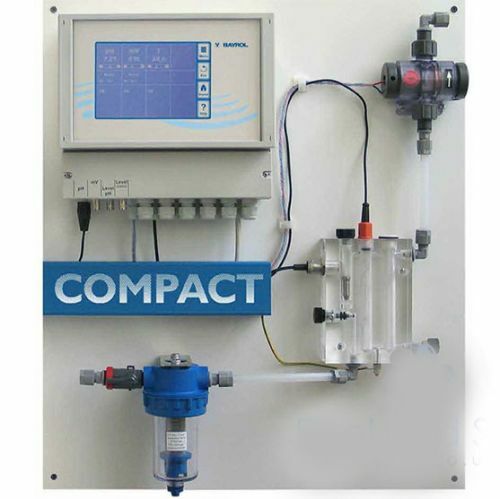 Typical of German engineering this commercial dosing controller offer a modern design and is simple to use. Best of all it offers customers reliability and stability - which is so important for all dosing controllers. If you fill in the Dosing Form below and email it back to us we can specify a number of suitable options for your project and needs.